I'm fine. Happy New Year. 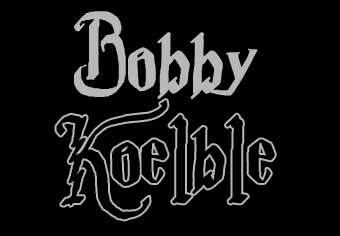 My name is Bobby Koelble. I was a guitarist with Death in the mid-nineties and played on the album "Symbolic". I'm currently a professor of jazz guitar at Rollins College in Winter Park, Florida. Where did the name "Junkie Rush" originate from and what does it represent? The name Junkie Rush describes the addictive effect of music. Tell us a little bit about your career with Junkie Rush. JR was formed in 2000, released 3 CDs (none with a label) and unfortunately disbanded in 2006. So far what are the messages that you receive in this promo tour for your new album? Right on. So when did you first start playing guitar, bro? When I was 14. My first instrument was the organ (which I began at age 7), but I switched when I finally realized there was no organ in Black Sabbath (lol). What's your favourite music? That is, what music does the band listen to and currently like? Who would you cite as influences? I have a very broad taste in music. I have an equal love for jazz, metal, classical, funk, reggae, Latin and electronic music and at one time or another have performed in each of these styles. My list of personal influences is a mile long, but I would say guitarists John McLaughlin, Paco De Lucia, Al di Meola, Frank Gambale, Allan Holdsworth, Danny Gatton, Tuck Andress, Joe Pass, George Benson, Miles Davis, Charlie Parker, John Coltrane, Wes Montgomery, Joe Diorio, Yngwie Malmsteen, Stevie Ray Vaughan, John Williams, Andres Segovia, etc. You appeared on Death's "Symbolic". Why did Chuck choose you? Did you know him previously? How did it all happen? Me and Chuck actually met for the first time through a mutual friend when we were both in high school, but didn't meet again until I auditioned for the band. I was told by a mutual friend at a music store he was looking for a guitarist and we got in touch with each other. I guess he liked the way I played and we instantly became friends. How was it to work with Chuck and Gene Hoglan? Playing with Chuck and Gene was the greatest professional experience of my life. Looking back, it went by extremely fast. Chuck was very easy to work with, not demanding at all in rehearsals. I always tried to be as prepared as possible so things would go smooth. I'm still friends with Gene to this day and I see him whenever he comes to town. If you had to choose your favourite "Symbolic" song, what will that be? To pick just one, I'd have to say the title track. What have been some of your best memories with "Death"? The whole time was a great experience. I got to visit places I had only dreamed of previously like Amsterdam, Prague and Madrid. Me and Gene definitely raised a lot of hell together (lol). Can you tell us about how was your relationship with Chuck? I have the utmost respect for Chuck, his music and his legacy. He was honestly a laid bak guy who enjoyed simple things like cooking, his dogs and his family. We always got along well. I think we only had one disagreement the whole time we played together. Tell me something about your story with Junkie Rush, and the differences between that and another projets? JR was a world-music approach to hard rock. We fused several different styles, but it was very song oriented and actually quite simple at times. I honestly don't think many fans of Death would like it, but some have. What are your touring plans? Where do you see yourself in the year 2007? Some members of JR are going to reform under a new name. I also have a project that fuses jazz and electronic music I'm very excited about. I miss playing heavy music and I hope I have time to do another metal project as well. Being busy is both a blessing and a curse (lol). Which records have marked your mind the most? What's is the next step for your and the band "Junkie Rush"? Do you have anything you would like to say to the readers of Zero Tolerance Webzine? Greetings and best wishes to you all. Thanks for helping to keep Chuck's music and spirit alive. I have fans out there? (lol) To anyone who enjoys what I do or what I've done, I'm very grateful. I can still be reached at www.myspace.com/junkierush Cheers!